Whether you have given up on the bar scene, don't have a lot of time to devote to going to singles mixers, or you're just shy, for whatever reason, you have turned to the world of online dating. Sometimes it's great, other times it can seem like the 7th level of digital dating hell. Maybe some of your other single friends have helped you get your bearings, giving you the names of some dating apps and services to try. Getting started in the whole online dating process can be somewhat intimidating. As you start to fill out your online dating profile, you begin to think about all the personal information you're providing and wonder what is safe to post to your profile and what's not safe. Let's take a comprehensive look at the world of online dating safety from a guy's perspective and go over some of the basic security and personal safety do's and don'ts, so you can hopefully have a safe and rewarding online dating experience. Before you ever open a dating account, there are several things you need to do. You might want to consider setting up a separate email account just for dating purposes. There are several reasons to consider this. Dating sites often send out a ton of dating-related messages and notifications. This might clutter up your main email if you use it as your dating site email. You might also meet some creepers online and you may not want them to have your real email so that you can avoid future harassment if things start to get strange. Consider getting a secondary Google Voice number to mask your real phone number. A free Google Voice number can be a great go-between for those times when you want to give a girl your phone number but you don't want to give out your real number until you get to know her a lot better where your comfortable giving her your real number. Now that you've got a dating-related email account and a secondary phone number, it's time to choose what dating sites / apps you want to use. Once you've selected one or however many you want, you'll need to build the all important profile. When you start out, you'll likely set up profiles on some of the more popular sites such as Plenty of Fish, OkCupid, Match.com, eHarmony, and more. Some sites require a monthly fee, others are free for basic use, but will offer paid upgrades to allow you to use premium features. For safety purposes, your online profile shouldn't read like a resume. You can talk about your job without telling potential matches where you actually work. Leave out the details, especially ones that might help a creepy stalker track you down. You should also avoid giving specific details about your family. You can say you're a single dad, but avoid putting the names and ages of your kids in your profile. Seems like common sense but many people actually put this information in their profile. Just because Match.com asks you what your annual salary range is doesn't mean you actually have to provide that information. This is one of those little tidbits that should be left out of just about everyone's profile. Do you really want someone to disqualify you as a potential mate simply because you aren't in the right income bracket? That doesn't sound romantic at all, does it? Specific information is power, the more specifics you provide, the more potential risk you open yourself up to. Some sites may allow you the option of only permitting other paying members to view your profile, instead of just opening it up for view by random strangers. Using a profile privacy feature like this might help cut down on the scammers (or at least the scammers who don't pay to be on the site). While most dating sites likely strip out the geotag (GPS location data) of any picture you upload, you should remove this metadata before you upload it, just to be on the safe side, otherwise scammers and crazies might be able to track you down using the location data, and that wouldn't be good at all. For the safety of your kids, family, and friends, you should probably blur or crop out the faces of anyone in your profile photos besides yourself. This also helps avoid confusion of who is actually the eligible bachelor. You don't want to meet a lady in person and find out that she was expecting to meet the guy that was standing next to you in your profile picture. AWKWARD! So you've got the perfect profile built and now the search for that someone special is underway. How do you tell who is legit and who is a scammer or a catfish? Look for telltake scammer and catfish red flags. The dating site scammer's goal is to get you to click their link, visit their email, or call their scam number as soon as possible so that they can either infect your computer, harvest your personal information, or steal your credit card details. That's what they want. They are so eager to do this that they will usually put web links in their profile, practically begging you to go and visit their site. These are obvious scams. Some will take the long road and try to chat you up a bit before they hit you with the link. The end game is always the same though, they want you off the dating site and into an area they control. So once you see that link, email address, or phone number after only talking to them for a little while, it's a very strong indication that it's probably a scam. Scammers who are phishing for personal information will often ask you things like your birthday because that's what they need to steal your identity. They may do it in a playful flirty way, but that's just their way of trying to get the information without setting off your mental alarms. If they get too personal, just stop talking to them and report them to the dating site if you really think something seems phishy. Scammers will often use modeling head shots that they find online as their scam profile pics because most guys will forgo common sense when they think a beautiful woman is attracted to them. They might take more of a chance on a super hot woman than they would normally. It's like they want to believe this obvious fake profile is real because they want it to be real, even the slim chance that it's not a scam is all most guys need to pursue, and scammers know this. Scammers are usually pretty terrible with grammar, spelling, and use of colloquialisms (informal language). Thankfully, this seems pretty pervasive and is a great big red flag that something isn't right. If their language doesn't sound right to you, trust your instincts: They are probably a scammer. Lazy scammers sometimes think less is more and will often forgo the written part of the profile entirely so they don't get caught using terrible grammar and setting off your mental defenses. Blank profiles with beautiful pictures are pretty common as this requires the least amount of effort on the scammer's part. Some scammers will use bots (automated chat scripts) to do their bidding. These have gotten more convincing over the years. They seem especially prevalent on Tinder. 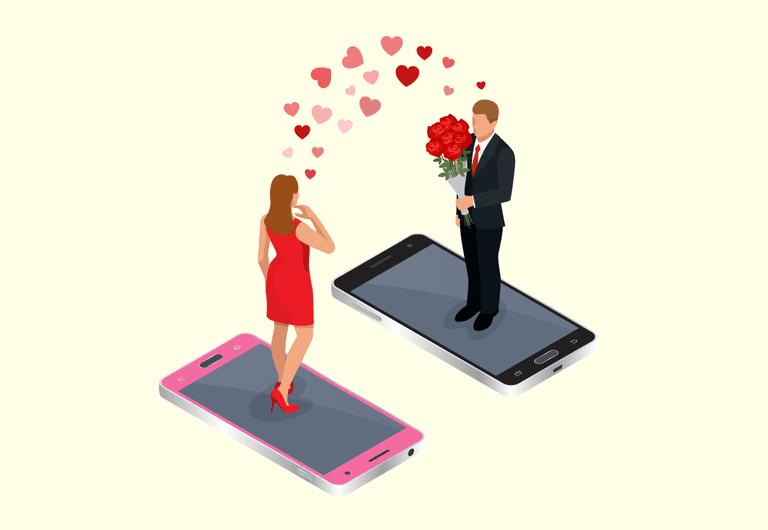 Check out our article: Is My Online Date Really a Scam Bot? to learn much more about this high-tech dating scam.